THE U.S CONSTITUTION IS DEAD! The constitution is alive! It's both. It's neither. Only the founders know for sure and for sure they're dead. 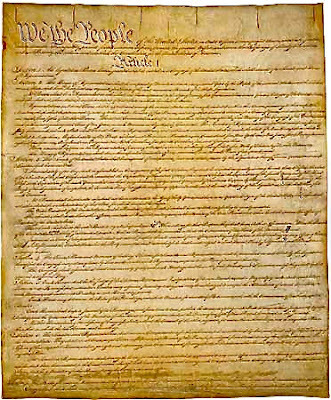 On this date in 1787, that document was signed by a collection of people who managed to put aside their differences to forge a compromise that became the greatest governing document the world had -- and has -- ever seen. Since then its been revered and criticized, praised and fought over, a virtual Rohrshach inkblot of political preferences and predispositions, with those fighting over the framers' intent swearing the only correct reading favors their side, whatever side that is. "The Eed Plebnista," and "holy of holies," it was also the great reveal of one of the worst episodes of the original Star Trek, keying on its opening incantation, "We, the people." Though surely not the framers intent, the preamble following those words proved surprisingly singable, educating a generation of kids that grew up on School House Rock (though John Popper of Blues Traveler fame, did a pretty kickin' rendition too). Among its 39 signatories: George Washington, Alexander Hamilton, James Madison and Benjamin Franklin. Among those who refused: Elbridge Gerry of Massachusetts, father of the gerrymander, and Virginians Patrick Henry, he of "give me liberty or give me death!" and George Mason. Of course, the story of the Constitution didn't end with its drafting 230 years ago, or with its subsequent ratification. Not even close. While its original three articles set up our government, Congress, the presidency and the judiciary, there were a host of issues left unaddressed, though not for long. and that those powers not covered by its three original articles, were left to the people and the states. 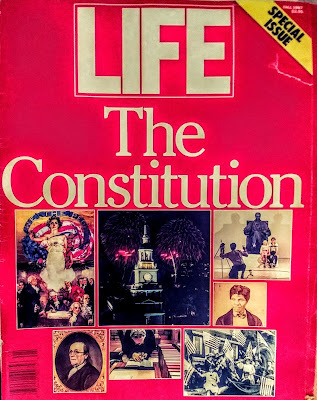 Down through the years, still more amendments were added, the guarantee of equal protection of the law, prohibiting slavery, briefly and spectacularly unsuccessfully banning the consumption of alcohol, giving blacks and women the right to vote, lowering the voting age from 21 to 18, giving the government the right to collect taxes and limiting presidents to no more than two consecutive terms in office. And still it people say it is simultaneously overbroad and incomplete. 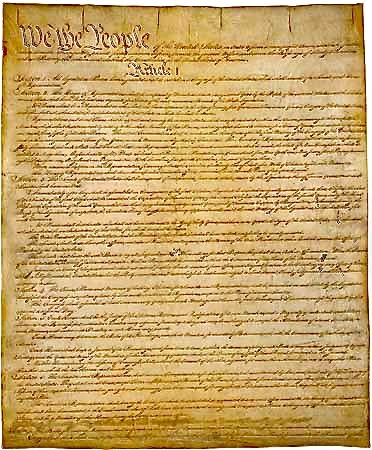 There are those who say it's a living document one that must be read in the context of its times, containing implied rights, like the right to privacy, there are others who say that's its wrong to try to read into the document what isn't there, that it's a dead document, its meaning static and fixed, to be applied as written. Its unlikely the debate will ever end and that's a part of its inherent greatness. The Constitution is dead! Long live the Constitution! Trekdom's New STD: The Gift That Keeps on Giving?